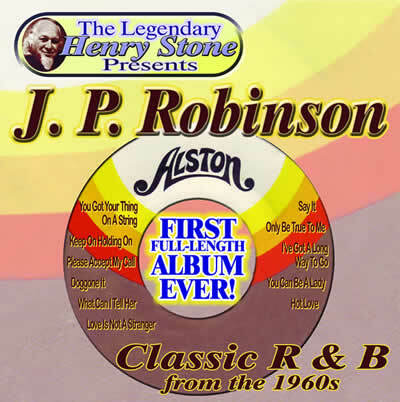 After years of making 45 singles, this album represents the first full-length release for J. P. Robinson. He started recording for Henry Stone on the Alston label in the late 60s. J.P. “Pooleroo” Robinson, out of West Palm Beach, was discovered by Joe Fisher, a well-known radio disc jockey from WRBD in Ft. Lauderdale. Robinson was introduced to Henry Stone, who gave the okay for Clarence Reid and Willie Clarke to write and produce his songs, which they did with a flamboyant, energetic sound. According to Willie Clarke, “J. P. seemed to go berserk at the microphone. He was so caught up in the feel of his songs, at times we thought we would have to hit him with a bat to calm him down. He was electric!” When he was going to do a recording session, people would try to get in on it to watch him work. His sessions were like watching a show.